We had a great time with our kids in Portland, and Brenda managed to get her shopping fix-- something desperately needed from time-to-time when you live in the boonies. Our daughter lives on a very low-traffic street, so we set off our legal fireworks in the center of it, while getting a great show from all the illegal ones rocketing into the air all over the neighborhood. I'll be in Missouri this coming week, doing some restoration work on one of my exterior murals. There were some problems in the construction of the wall that allowed moisture to get behind the paint layer in some places, so I'll be doing spot repair and putting a UV coating on it. Not exactly fun, but it will be nice to re-connect with folks I haven't seen for several years. I've done a series of drawings that Brenda will be posting for me while I'm gone. There is something so gratifying about the basic and simple act of drawing. Doing this series reminded me how much I am still in love with the magic of illusionism--how with a few lines and smudges of graphite, an object suddenly seems to lift itself out of the white of the paper. 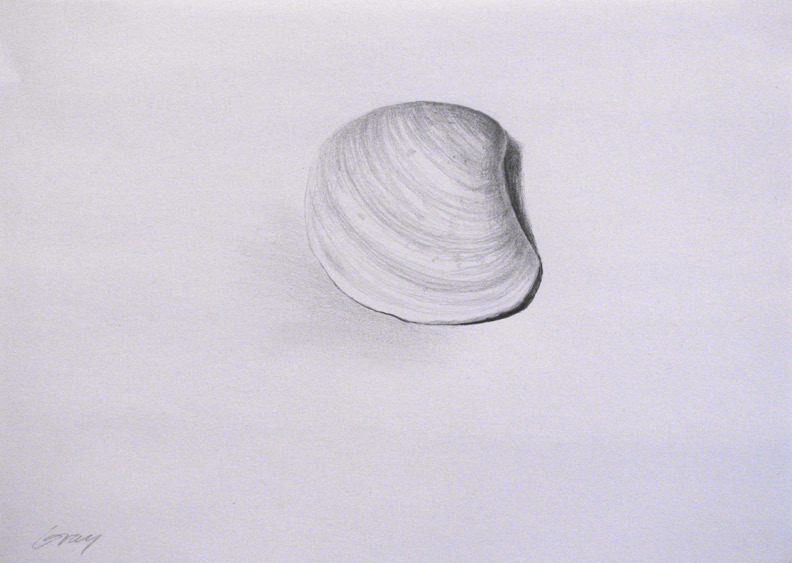 The rest of the page--in this case, the unmarked spaces around the shell--becomes important too. Somehow the drawn image "charges" the emptiness with a feeling of almost physical presence. After all these years, I still am amazed at how an untouched white inside the drawn image seems different than the untouched white outside it. I guess it points up the power of the mind to imagine, and to suspend disbelief. The relativity of color fascinates me. Here, you have the effects (as you discussed) of the relativity of value. I'm really enjoying your pencil-shells series. LOVE them! Hi Ruth--thanks. I'm in Cuba, MO, a little town 80 miles SW of St Louis, on Route 66. Fun is not the operative word for this repair project, but it is going well. Yes, I like that term, Jala--the relativity of value...exactly! Hi Don. Wow, these are really magnificent--big word for such a humble subject, but you have brought the elegance of this little shell to the fore. I have tried and find it most difficult to capture such a (seemingly?) simple subject! Hi Laura--really nice to hear from you and thanks for the kind words. I'm enjoying your recent watercolors.